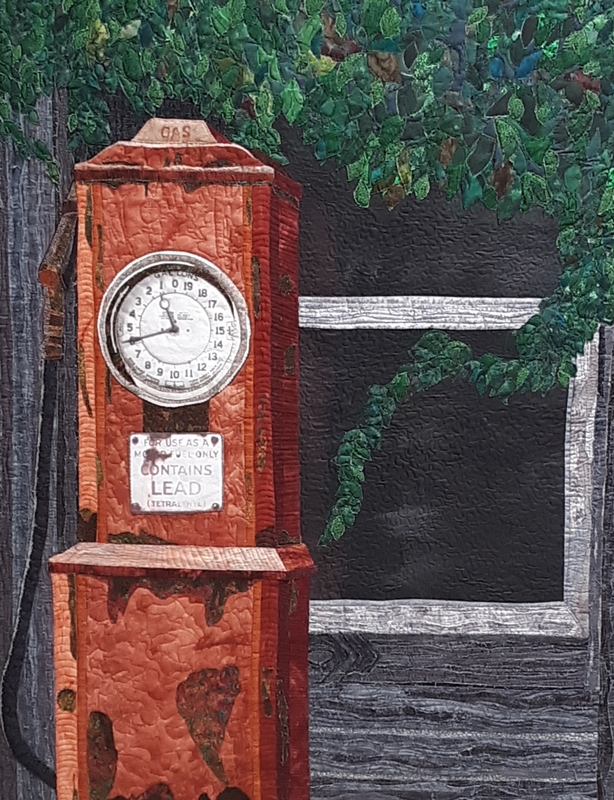 "Old Gas Pump: Acceptance" 30x40" Art quilt $1,400 All fabric, fused and turned edge applique, heavily quilted. No longer needed She stands beside the road Resplendent in rust. 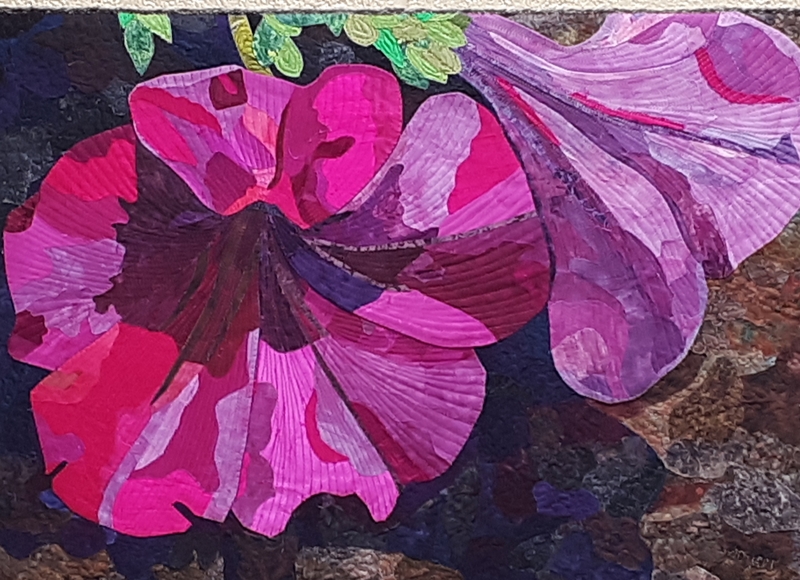 Petunias: Determination 28x22" $850.00 Art quilt combining fused and turned edge applique. Materials include cotton, silk, polyester. Pieces was sandwiched with a backing and batting and then heavily quilted. Mounted on a canvas for easy hanging. This series is a fabric interpretation of photos I have taken. As each piece was created, a haiku formed ... telling me what the piece was saying to me. These pieces were created over the last two years. 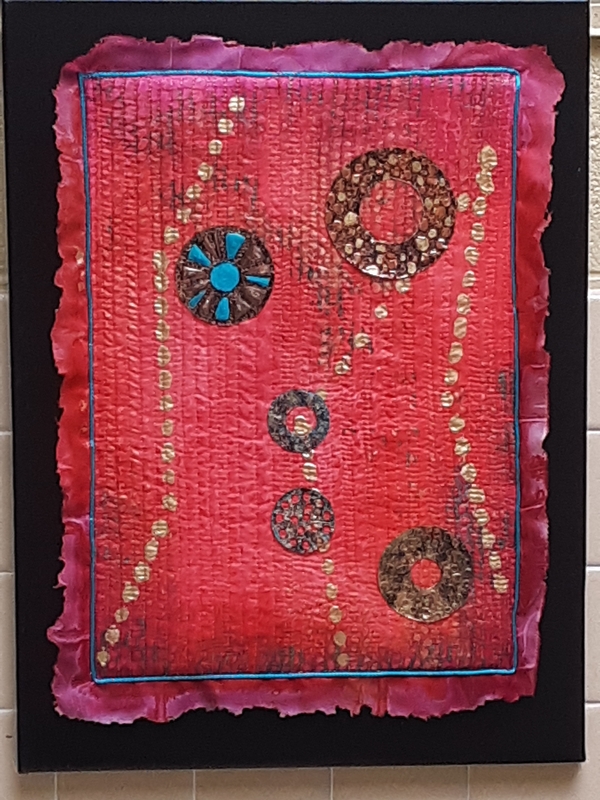 I used a combination of fused and turned edge applique to create them and quilted them heavily to re-inforce the textures of the images. Crepe Myrtle: 30x40" All fabric Method: fused applique Materials: commercially available cotton, silk, polyester fabrics Heavily quilted. Note veining on leaves at bottom...all quilting. No computer was used in the creation of this wok. Art quilt 30x40" $1,400.00 All fabric with heavy quilting. Outside of here There are hills and streams, fields and air. Walls come at a price. 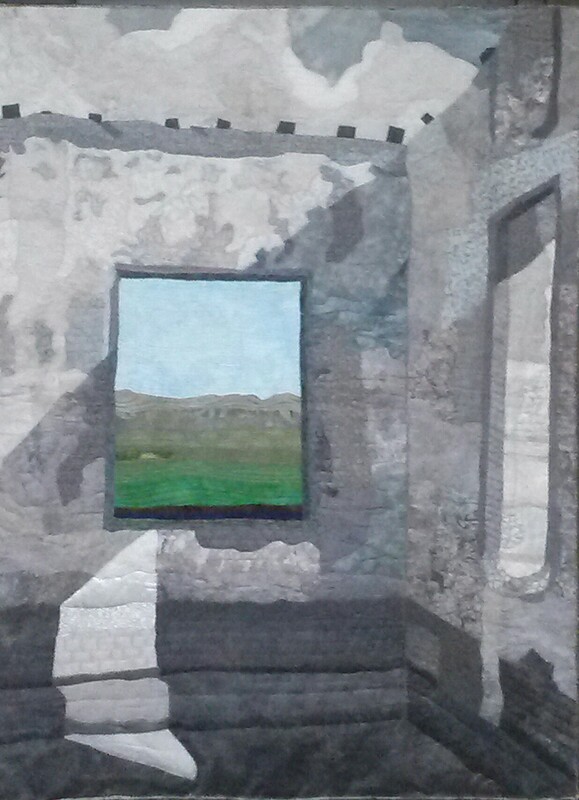 Precarious 30x40" $1,170.00 3-Dimensional are quilt. 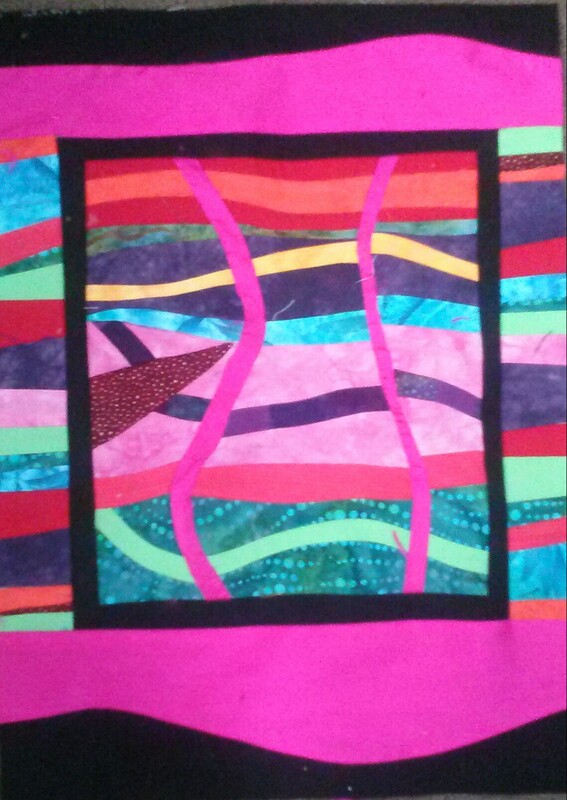 Quilt featured fused and turned edge applique and heavy quilting. Materials include a variety of fabrics, wire and other support materials to push rock pile away from background. Precarious Together we built Cairns as solid as pebbles, As fragile as dreams. 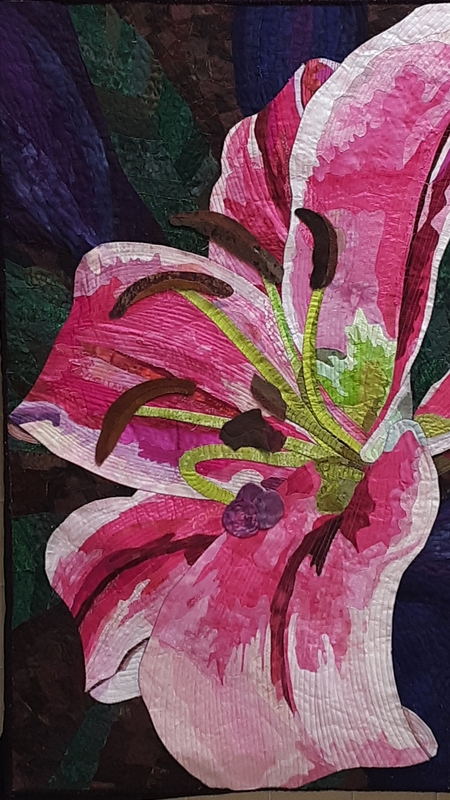 This is a series of quilts featuring flowers. All have been made between 2017-2018. Again, as the pieces were created, a haiku formed, revealing what the quilt wanted to say. 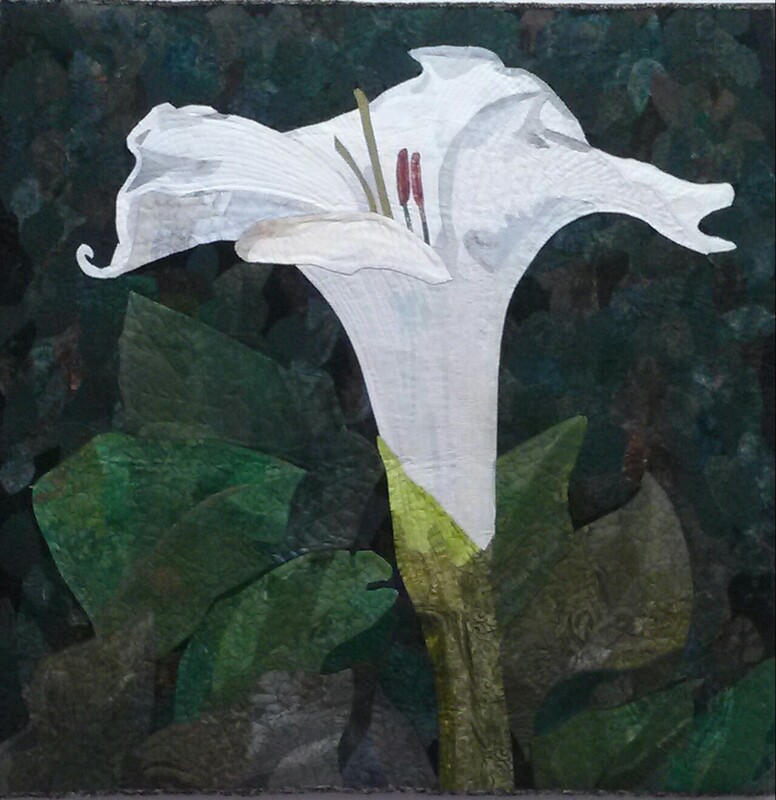 Petunias: Persistence $850.00 Art quilt constructed with commercial fabrics such as cotton, silk, etc. Technique: fused and turned edge applique. Petunias: Persistence "Insignificant" They called her, "Ordinary." Still she persists. 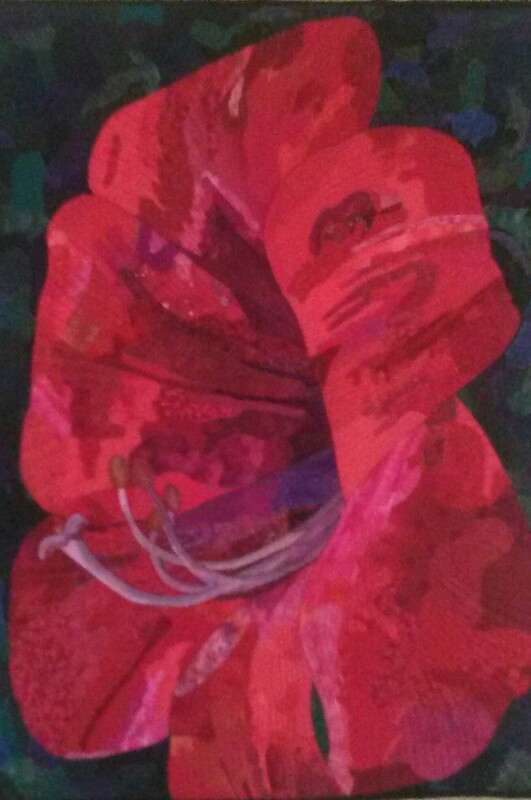 "Red Lily" 30x40" $1,400.00 Art quilt constructed of commercial fabrics such as cotton and silk. Construction method: fused and turned edge applique. 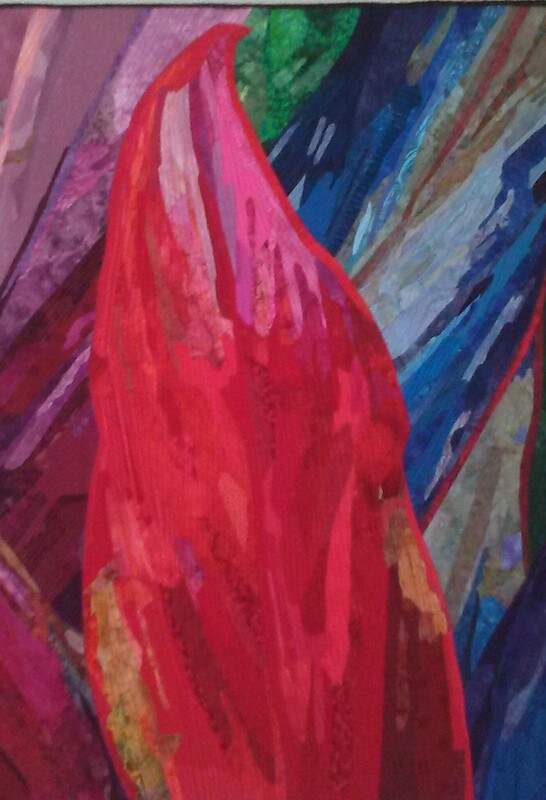 "Amaryllis: " 30x40" $1,400.00 Art quilt constructed using commercially available fabrics such as cotton and silk. Method: fused and turned edge applique. 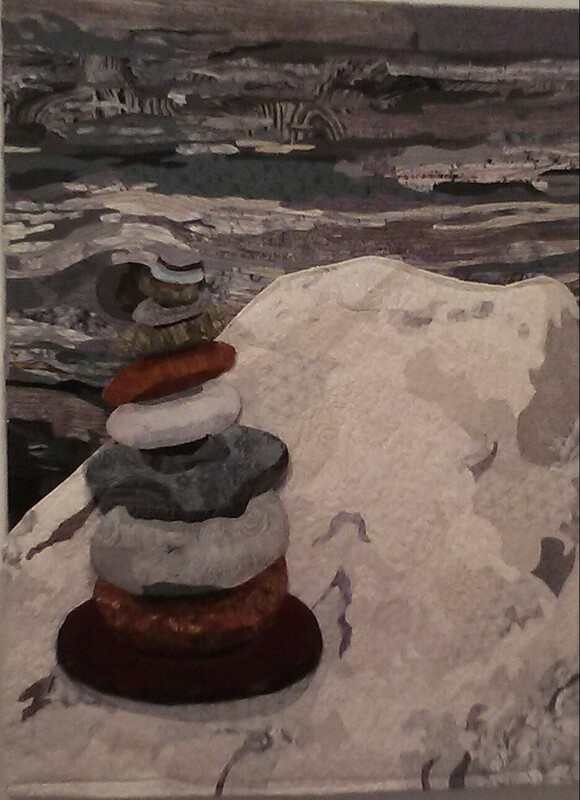 "Beacon" 30x40" $1,400.00 Art quilt constructed of commercially available fabrics such as cotton and silk. Method: fused and turned edge applique. 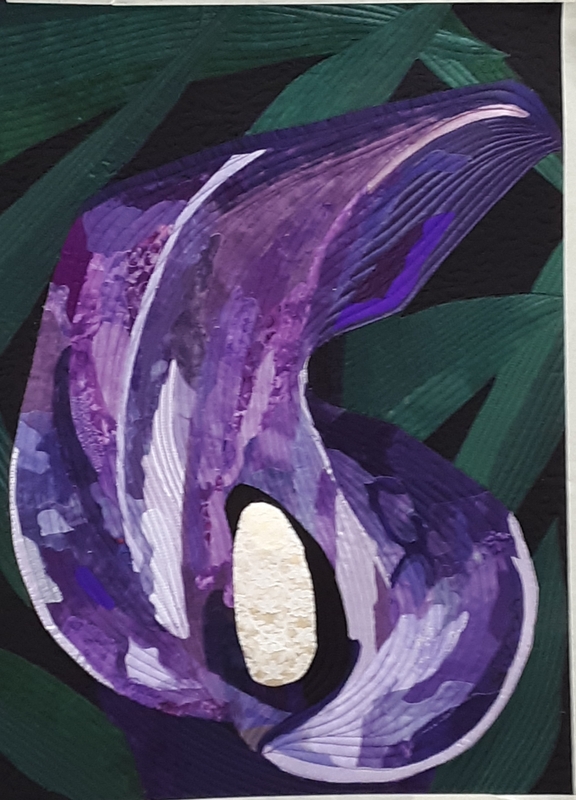 Black Cala Lily: Confidence 28x36" $850.00 Constructed of commercially available fabrics such as cotton and silk. Heavily quilted and mounted on a canvas for easy hanging. Black Cala Lily: Confidence Her sinuous lines and curling petal earns stares. She sees and then smiles. 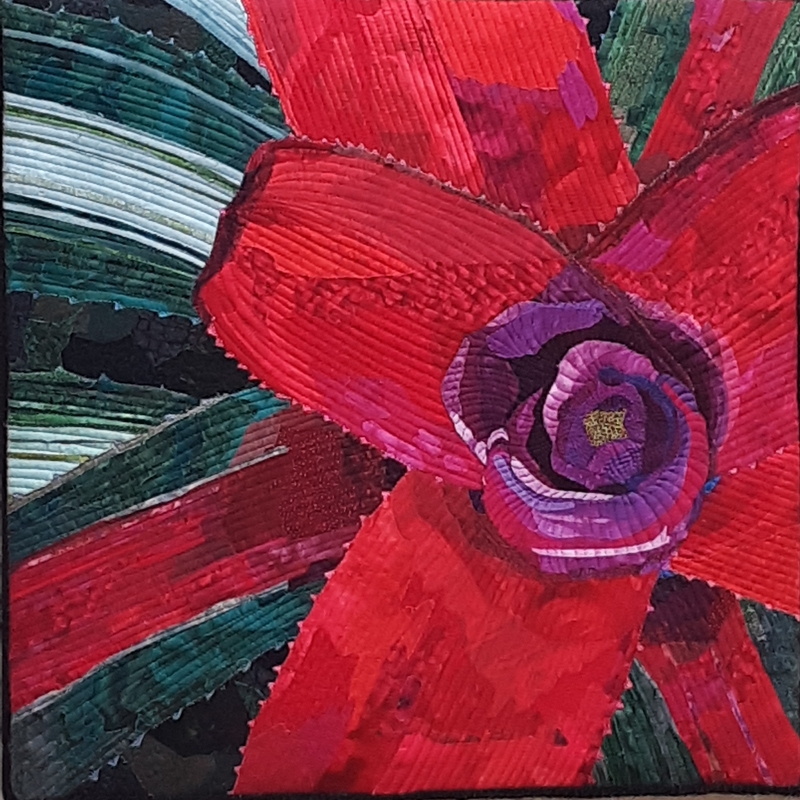 Bromeliad: 30x24" $850.00 Constructed of commercially available fabrics such as cottons and silk. 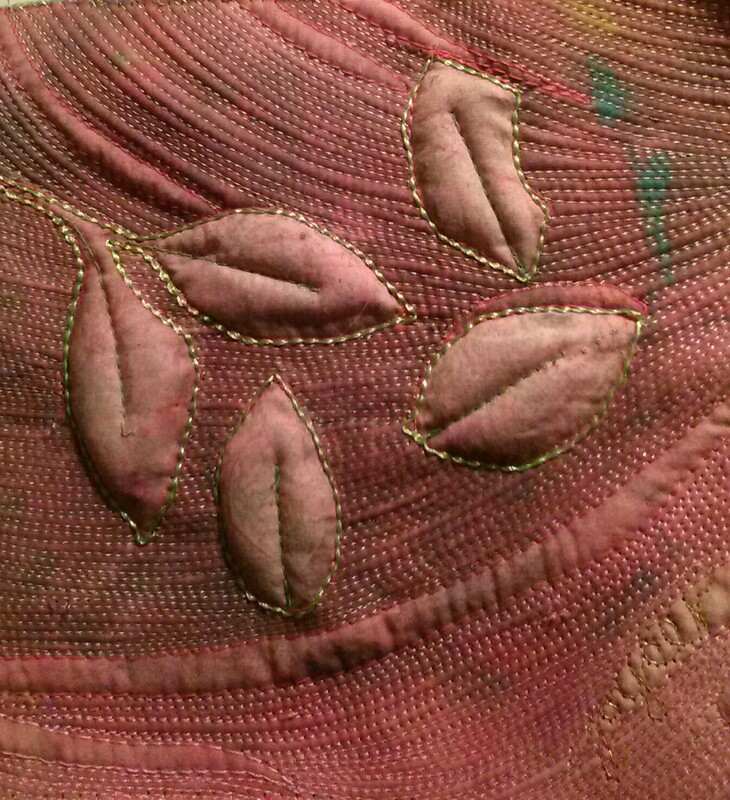 Technique: fused and turned edge applique. Heavily quilted and mounted on a canvas for easy hanging. Bromeliad The plants core is cupped To capture rainfall and dew. Closed hearts can't catch joy. Morning Glory: Faith 30x40 Sold. Constructed of commercially available fabrics such as cotton, satin and transparent silk to create illusion of translucence. Technique: fused and turned edge applique and mounted on a canvas to ease of hanging. Morning Glory: Faith Despite the darkness She lifts her head and sings out: Good morning, Glory! We all have names (nouns) but it is our actions (verbs) that say who we are. The pieces in this abstract series are a combination of gold and one other color. Each is named with a word that is both noun and verb. Gold and White: Glow 30x40" Sold A combination of gold metallic fabrics including lame, dance fabric and ribbons and white fabrics, mostly satin and silk. Heavy quilting. 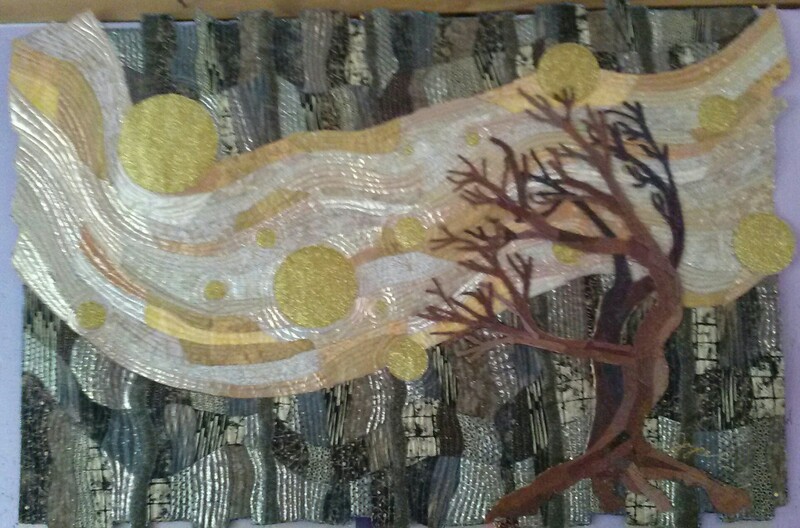 Gold and Brown: Reach 36x28" Sold The background is pieced with appliqued circles and trees. The trees are made of approximately 7 different leathers. The piece is heavily quilted. 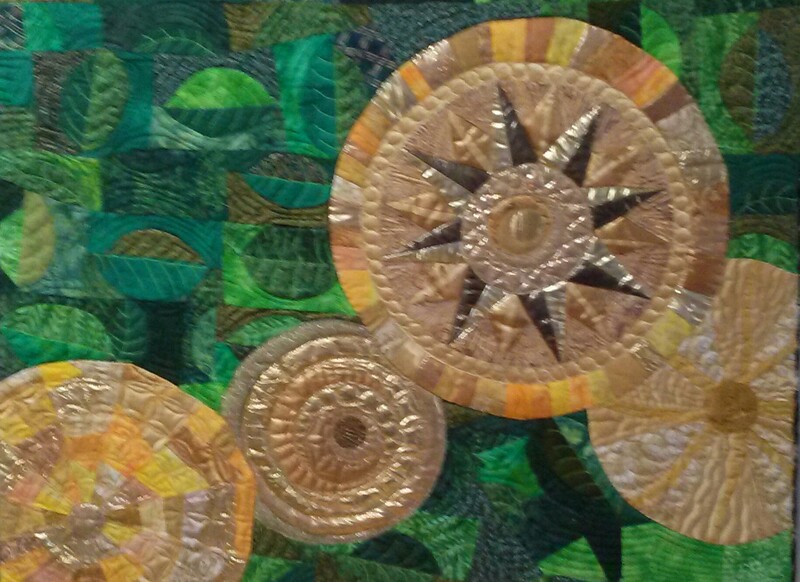 Gold and Green: Bloom 36x28" Sold A classic Mariner's Compass is paired with simpler pieced and appliqued circles on a field of leaves. 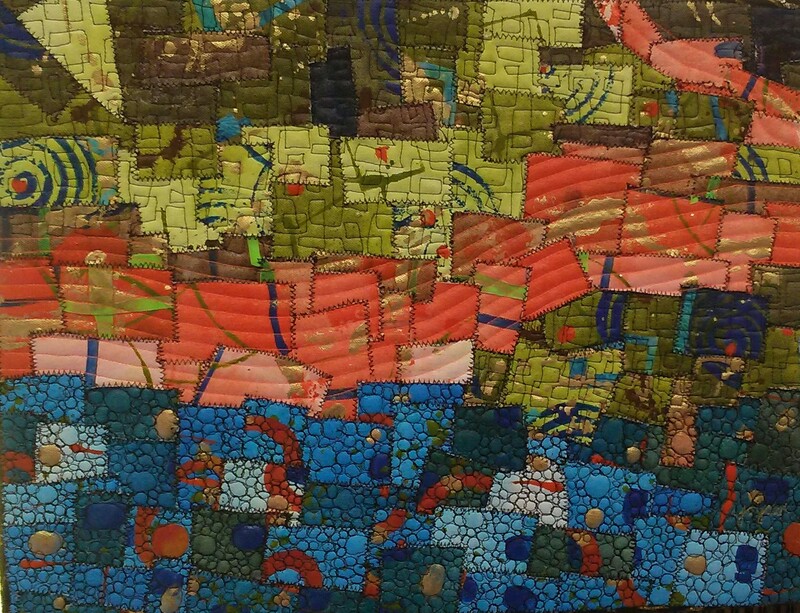 The background is a technique known as improvisational piecing. 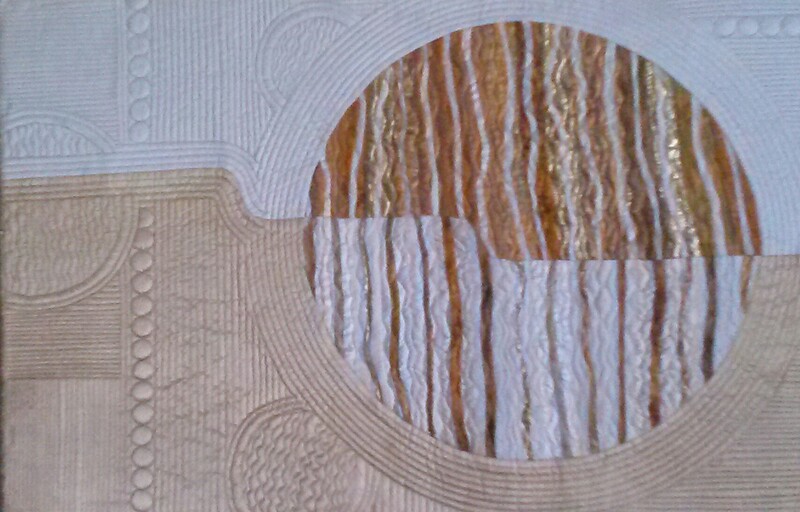 Gold and Silver: Dance 30x40" $850.00 This quilt is completely pieced -- each of the hundreds of pieces is seamed to those around it. 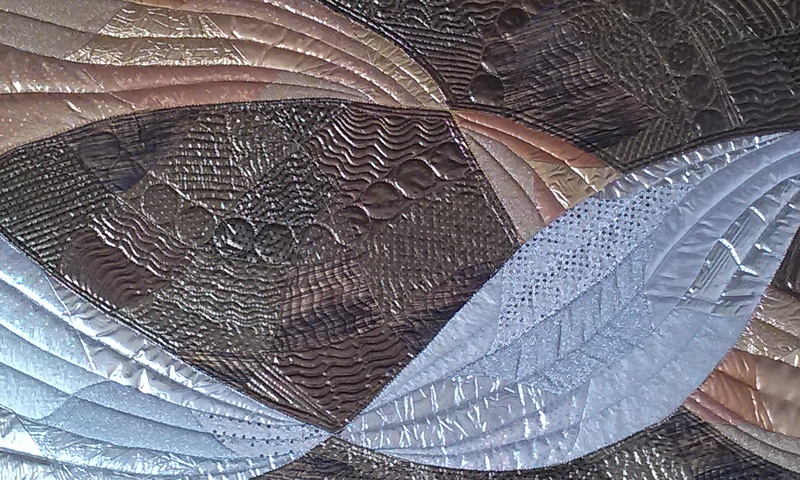 It is heavily quilted and featured mainly metallic fabrics. 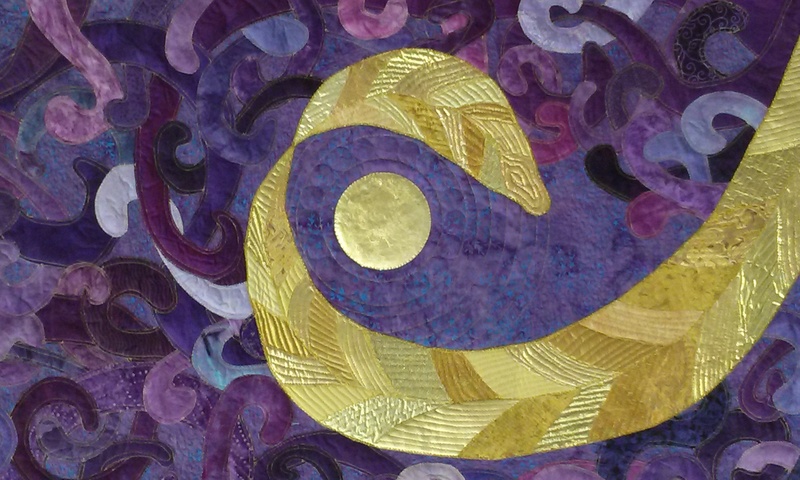 Gold and Purple: Shelter 30x40" $850.00 The large gold curve is pieced and then appliqued onto the background of appliqued curved pieces. In an effort to improve my skills, I take as many courses as possible. 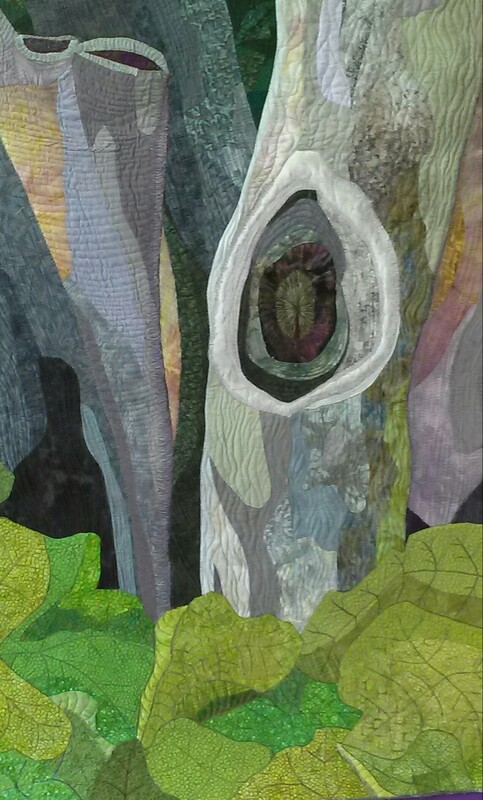 When funds are available I go to the Quilt Surface Design Symposium in Columbus, Ohio. I generally take two course but if I am flsh I maytake as many as 4 classes. The techniques I study nmay not apply to the work I am currently involved in, but I believe my work improves from being exposed to other expressions. The quilts in this section are experiments with techniques that I have studied. Autumn Leaves Sold This piece was an exploration of complex piecing using highly unusual fabrics in quilting. Pathways: 16x20" Sold Improvisational piecing featuring silks and cotton batiks. Leaves 16x20" Lost in first Ellicott City flood. Improvisational piecing.